The South by Southwest Interactive conference is over, but a few top brands and companies left a considerable trail of social media chatter in their wake. Samsung, Twitter, YouTube, Foursquare and Chevrolet were among the brands that got the most social media love at the five-day tech confab in Austin, according to data from social media analysis firm NetBase. Exclusively for Adweek, NetBase monitored the fire hose of social media commentary coming out of the conference. Over the five days, the company said, SXSW generated more than 500,000 mentions in total, primarily by people whose online accounts indicate that they are from California, New York and Texas (19 percent, 18 percent and 17 percent, respectively). The overwhelming majority of chatter was on Twitter (93 percent), with Facebook and blogs contributing 3 percent each. “This is a show with an incredibly strong social voice,” said Lisa Joy Rosner, chief marketing officer for NetBase. The volume is especially significant, she continued, when you consider that six years ago, there were just 200 tweets a day. 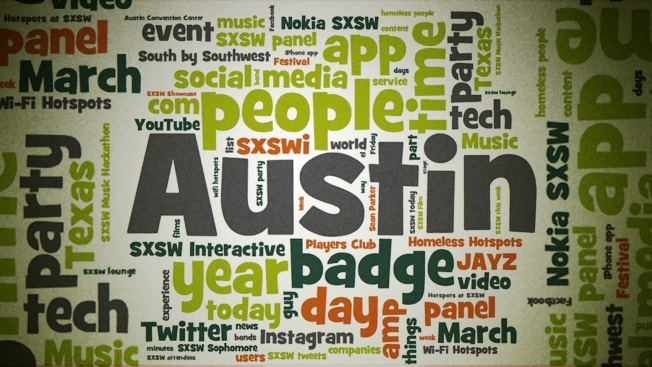 Now, there are 300 million tweets a day globally, 100,000 of which came from SXSW this past week. Not surprisingly, Austin and social media featured prominently among the top social media themes picked up by NetBase. But so did Foursquare badges (and their free breakfast tacos), the controversial “Homeless Hotspot” stunt organized by marketing agency BBH, Chevrolet and Samsung. Even though John Mayer was a SXSW no-show (he cancelled his appearance because of throat issues), he was the person who generated the most social media buzz, followed by Texas Gov. Rick Perry, who dropped by CNN’s pop-up grill for an intimate talk. Of all of the brands represented at SXSW, NetBase found that Twitter, Instagram and YouTube were among the most mentioned overall. Among non-media/tech brands at the conference, such as Samsung, Chevy, American Express, Nike, Pepsi, GE and Nokia, Samsung generated the biggest volume of social media buzz, with about 165,000 mentions. But Chevrolet, which dispatched a fleet of cars to the conference to help attendees get around for free, generated the most positive buzz. NetBase found that both passion intensity and net sentiment were highest for the car maker. When the company looked at themes according to positive or negative attributes, it found that “free breakfast tacos at foursquare lot” appeared prominently in the word clouds for people from California, New York and Texas. (Although “Jay-Z”—a reference to the SXSW concert organized by American Express to promote its new Twitter-enabled discount program—was the most buzzed about positive theme generated by California-based chatterers). Given the attention paid to social discovery apps, NetBase also looked at the amount of buzz generated by each startup and found that Highlight dominated the social media conversation, capturing about 72 percent of the buzz about the apps. Glancee followed with 13 percent, followed by Sonar with 8 percent, Banjo with 6 percent and Kismet with 1 percent.